FAO Schwarz, which has stood for experience for over 150 years, returns to New York with a new flagship store. 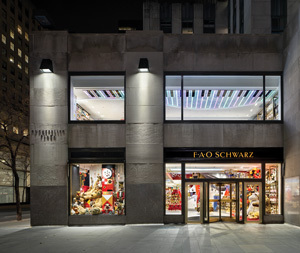 On November 16, 2018, more than 3 years after closing its world-famous Fifth Avenue store, the one and only FAO Schwarz has returned to New York City with a brand new flagship store at 30 Rockefeller Plaza. It’s been a storybook journey for the world’s most famous toy brand, founded by Frederick August Otto Schwarz in 1862 as a marvelous emporium filled with one-of-a-kind toys curated from around the world. Its newest incarnation, set among the Art Deco splendor of Manhattan’s famed Rockefeller Plaza, is sure to remind shoppers of days gone by and childhood nostalgia with its FAO teddy bears and whimsical clock tower — but it will also speak very much to the future. That future is something FAO Schwarz has already been doing very well for more than a century: experiential retail. “FAO Schwarz has stood for experience for over 150 years,” says David Conn, CEO of ThreeSixty Brands, which purchased FAO Schwarz from a flailing Toys “R” Us in October 2016. Two years later, Toys “R” Us filed for bankruptcy and closed all stores, but FAO Schwarz is back. And it’s back better than ever. 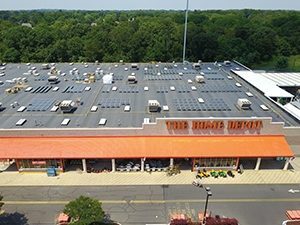 Inside the 20,000-square-foot space, spanning two and a half levels, the floor bustles with magic shows, product demonstrations and unique product customization. At the FAO Raceway, children can design their own remote control cars and then, with the help of trained in-store ‘mechanics,’ build them. Also new is the FAO Schwarz Baby Doll Adoption Experience, where nurses and doctors walk children through the adoption process and teach them how to love and care for their baby dolls. 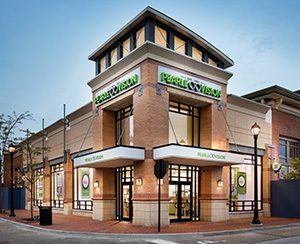 There’s a grocery store from Melissa & Doug where children can shop for toy food and cooking accessories. 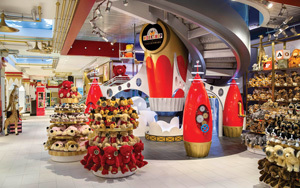 Build-A-Bear has a workshop in-store and its teddy bear astronauts man the new 27-foot-tall FAO rocket ship. 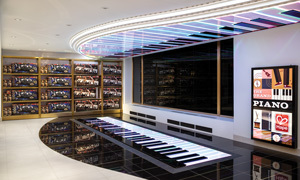 Hape Music reprises its role with the larger than life dance-on piano, made famous in the 1988 Tom Hanks movie Big — but this time the piano is reflected on the ceiling, too, so people can view the dancing light display from outside the store in Rockefeller Plaza. 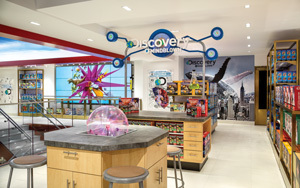 The Discovery #mindblown kiosk is designed as a science lab, complete with a real STEM professor, giant video wall and in-person demonstrations. FAO Schweetz-branded products are back, too, with giant gummy bears and mega chocolate bars. 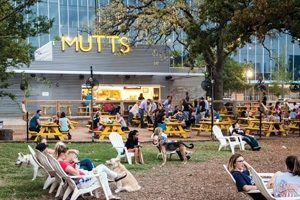 The new space was designed by retail design firm Chute Gerdeman, which capitalizes on the Art Deco architecture of FAO’s new home and amplifies memories of the best FAO experiences from years past. Toy soldiers are stationed outside the Rockefeller Plaza store entrance, but in a wink to modern times, their uniforms were designed by international supermodel Gigi Hadid. The FAO clock tower returns to the new store, but this time it’s nearly three stories tall and customers can walk inside, climb up and wind around it to discover new sights and sounds within the store. Overall, the store’s interior evokes an old-timey toy factory: lots of moving parts, gears and whistles, always on the go, always animated. FAO Schwarz also brings unique shopping experiences to the thousands of department stores in which it sells merchandise. When ThreeSixty Brands, whose parent company is ThreeSixty Group, acquired FAO Schwarz in October 2016, it launched FAO seasonal shops inside many high-end department stores in time for 2017 holiday shopping. 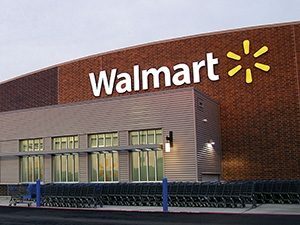 A year later, the brand has its new flagship at 30 Rockefeller Plaza, an expanded department store presence (with many shop-in-shops transitioning from seasonal to year-round in 2019), more airport stores (in early December, a new unit opened at New York’s LaGuardia airport), and a new FAO.com website launch. FAO Schwarz, already famous the world over, is also expanding around the globe. 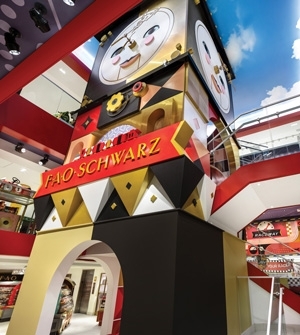 China is a key focus in 2019; in partnership with China’s largest toy retailer, Kids Land, FAO Schwarz will open a new 27,000-square-foot flagship store in Beijing in March 2019. Over the next 5 years, Kids Land plans to open 30 smaller specialty stores and shop-in-shops in 200 department stores in China. FAO is opening soon in Melbourne, Sydney, Madrid and more. 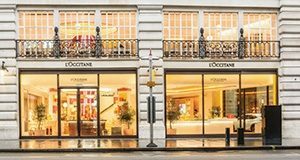 The company’s partnerships with Canada’s largest department store, Hudson’s Bay, and Selfridge’s in the UK are both thriving and growing. 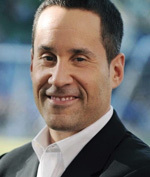 The antithesis of experience would be e-commerce, but Conn acknowledges that online giants like Amazon are very good at what they do and will continue to grow. But, there’s something magical about toy stores. 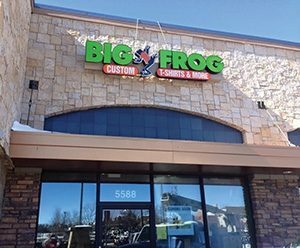 — This article originally appeared as the cover story of the December 2018/January 2019 issue of Retail & Restaurant Facility Business For more information, email the editor, Katie Lee, at katie@francemediainc.com.